On behalf of the team at Threshold Ventures (formerly DFJ Venture), I’m excited to announce that we’ve made a significant new investment in Rippling’s Series A. That round, announced earlier today, is being led by our good friend Mamoon Hamid at Kleiner Perkins, with whom we’ve had the good fortune to partner with on some great investments like Box, Front, Lumity and Yammer. We were already proud investors in Rippling, having secured a (smaller than we wanted) allocation in the Seed round, but we jumped at the opportunity to go above pro-rata and make a more significant (but still smaller than we wanted) investment in the Series A.
Rippling solves an unsexy problem but one that will also be instantly familiar to any HR professional who has managed a rapidly scaling company: the administrative pain of disconnected business systems, and the accompanying grind of managing information about employees in hundreds of different applications, each of which needs to maintain employees’ login credentials to authenticate their access and store their data. Rippling is the first employee system that works across the entire company — not just HR. They call it an Employee Management System to distinguish it from traditional payroll and HRIS, because Rippling integrates broadly across the entire company to automate wide swaths of administrative work. Rippling quickly becomes the canonical system of record and source of truth for employee information, as well as the hub upon which any number of additional application “spokes” can be built, by Rippling or by partners (of which there are ~500 and counting). In the two years since our original seed investment, Parker Conrad, Rippling’s CEO and founder, and the team have rapidly scaled the business and have proven out the effectiveness of their vision for a sizable number of customers. If you haven’t tried it out, I’d strongly encourage you to do so — it will dramatically improve the effectiveness of your HR and IT business operations. On a more personal note, Rippling is a special investment for me, in that it finally gives me a chance to work together with Parker, who I’ve known and considered a friend for going on twelve years. 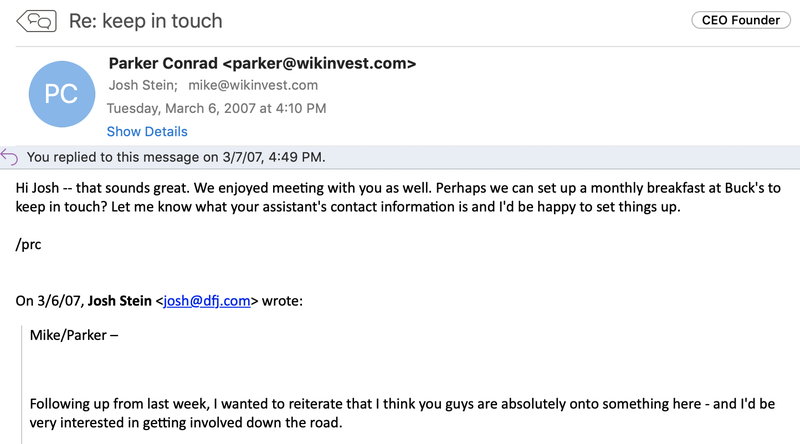 Parker and I were first introduced in 2007, when he was starting his first company, Wikinvest. Then, as now, he was smart, confident and articulate. And he had a big vision for democratizing the way financial information and analysis could be disseminated in the public market. I loved the product and the vision but wasn’t sure about the business model and, with other offers in hand, he needed an answer in 24 hours. We weren’t able to move that fast but we agreed to meet for breakfast at the world-famous Bucks of Woodside, something we then did about quarterly for many years. Parker was kind enough to come talk to me when he was starting Zenefits, but I underestimated the size of that market and by the time I’d realized I was wrong, the business had gone hyperbolic and was raising at prices beyond where we could play. But as the old saying goes, “the third time’s the charm” and when Parker told me about Rippling, I was smart enough to just say “please, take my money.” Our team jumped at the chance to partner with him, not based on the idea or the market (although both are compelling) but based on our conviction in *him* personally — a conviction that was formed by a decade of discussions and debates over breakfasts. Startups move fast and rounds often come together in weeks, if not days. It is a rare (but welcome!) luxury to be able to make an investment where our conviction in a founder is grounded in a context of years. Couldn’t be more excited to see where Parker and his team will take Rippling in the coming years!